To Coffee Or To Coffee. There Is No Question. Fun fact: Tomorrow, April 23, is the anniversary of William Shakespeare’s death. And what better way to celebrate the life of the playwright who gave us the wonderful stories of Romeo and Juliet, Hamlet, Much Ado About Nothing, and so many countless others than with the next post in my mug series? I love this mug so much that I have two of them, one for home and one for the office. I mean, who knows when I will be in need of a classic, English insult to vanquish my many uncultured enemies? As funny as this mug is though, it serves as a frequent reminder of my more adventurous days, like when I lived in London one summer and spent all my free time sightseeing and exploring between classes and studying. I was lucky enough to catch The Comedy of Errors at the Globe Theatre before heading back to the states. It also reminds me of the semester I took a Shakespeare class, which was taught by a hilariously flamboyant Catholic Brother. I am convinced that he would be waving the rainbow flag proudly if he had chosen a different occupation. Of course, let me not forget the technical benefits of this mug. 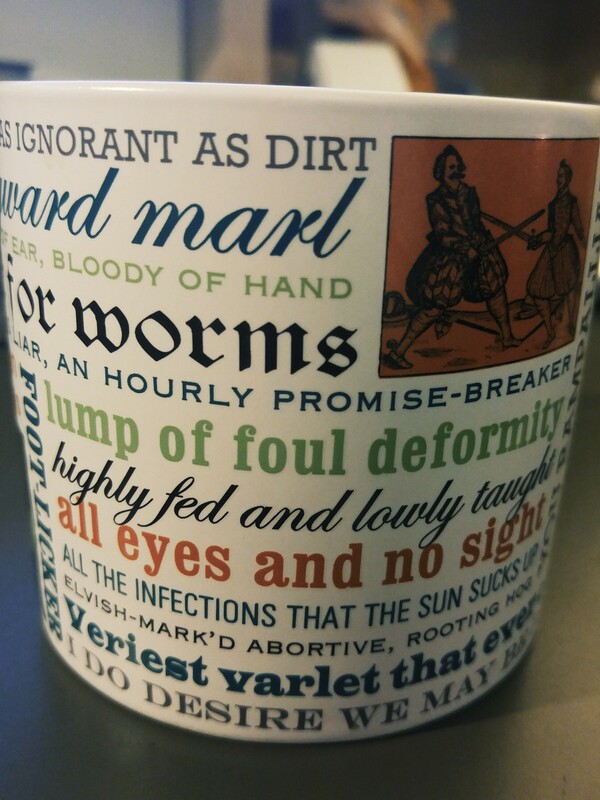 It is larger than the average mug and therefore better equipped to support my caffeine addiction, which is important as I might actually use some of these insults if in withdrawal.